Built in 1935 as a memorial to Mark Twain on his 100th birthday, the current lighthouse is the second to be built at this site. • 1934 Construction on the Mark Twain Memorial Lighthouse began. The metal framework structure, covered with sheet iron and plywood, was completed in less than two months. • 1935 The 100th birthday of Samuel Langhorne Clemens. The lighthouse was built as a monument to Hannibal’s most beloved son, as a symbol of his years as a riverboat pilot. It is purely ornamental, nestled too far inland to be of any use for river navigation. President Franklin D. Roosevelt lit the beacon from Washington, D.C. by pressing a gold key connected by telegraph lines. Clara Clemens Gabrilowitsch, Mark Twain’s daughter, spoke about her father in a live radio broadcast from Detroit. • 1947 Stone steps with an iron railing were constructed from the bottom of the rock quarry below the lighthouse to the top of the hill. • 1960 The lighthouse was leveled by a fierce windstorm. 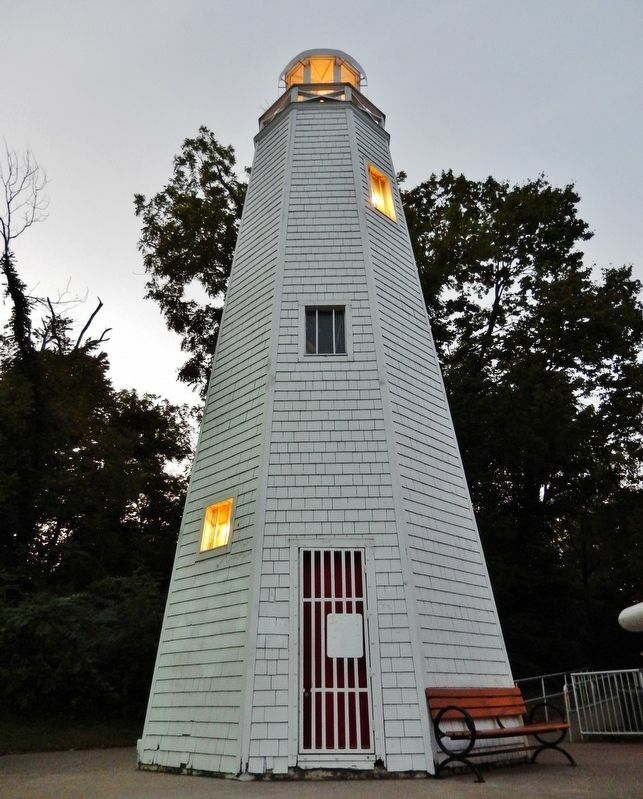 • 1963 The lighthouse was rebuilt, this time with wood and cedar shingles, and re-dedicated with President John F. Kennedy lighting the beacon. Girl and Boy Scouts lined the steps with candles and the flame passed from scout to scout up the hill. • 1994 A two year renovation revitalized the lighthouse and it was rededicated with President Bill Clinton lighting the beacon. This time Boy and Girl Scouts lit a string of flashlights. • 2000 The Mark Twain Memorial Bridge changed locations, making it impossible to walk up the steps from the Tom and Huck Statue to the lighthouse. • This photo, taken in 1938, shows visitors on the wooden steps to the lighthouse. • In 1935, a lighthouse replica was displayed during a parade celebrating Mark Twain’s centennial. • In 1960, a windstorm with 70-mph winds demolished the structure. This photo, taken in 1963, shows the Mark Twain Memorial Bridge approach atop the rocky incline above the statue. Erected by Hannibal Parks & Recreation. Location. 39° 42.868′ N, 91° 21.537′ W. Marker is in Hannibal, Missouri, in Marion County. Marker can be reached from the intersection of Rock Street and Mark Twain Avenue (North 3rd Street) (Business U.S. 36). Touch for map. Marker is located beside the subject lighthouse, overlooking the Mississippi River and Illinois to the east. 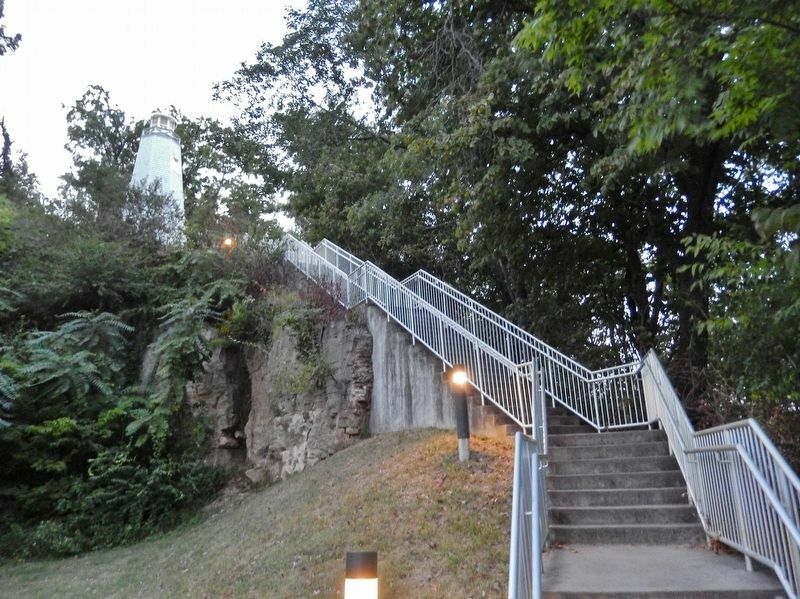 Marker and lighthouse are about 1/10 mile from the intersection, and then by foot up a long, steep flight of stairs from the Rock Street parking area. Marker is in this post office area: Hannibal MO 63401, United States of America. Touch for directions. The Jail in "Tom Sawyer" (approx. 0.2 miles away); Mark Twain (approx. 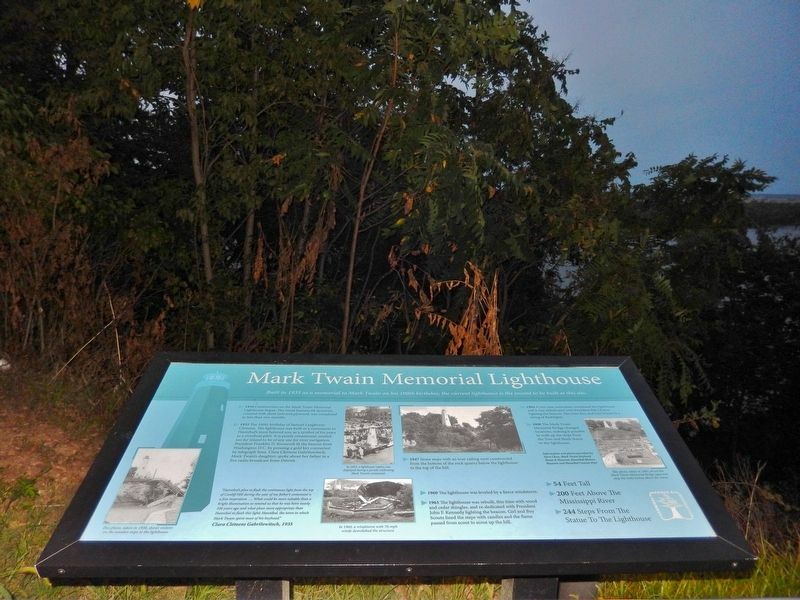 0.2 miles away); a different marker also named Mark Twain (approx. 0.2 miles away). Touch for a list and map of all markers in Hannibal. More. Search the internet for Mark Twain Memorial Lighthouse. Credits. This page was last revised on April 10, 2019. This page originally submitted on April 8, 2019, by Cosmos Mariner of Cape Canaveral, Florida. This page has been viewed 40 times since then. Photos: 1, 2, 3, 4. submitted on April 9, 2019, by Cosmos Mariner of Cape Canaveral, Florida.